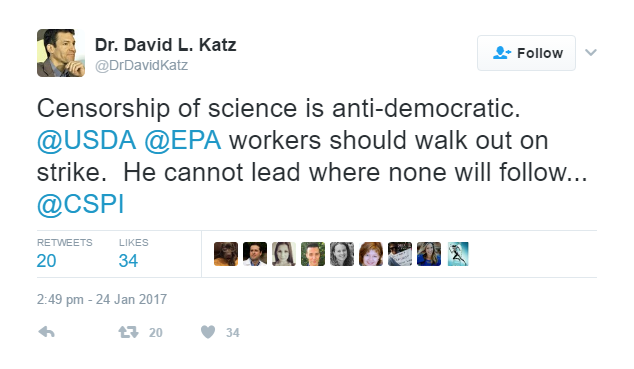 Per the above tweet, author/columnist Dr. David L. Katz, founding director of the CDC-funded Yale-Griffin Prevention Research Center, alluded to reports that newly elected US President Trump had ordered a communications lock-down of several federal agencies, including the USDA, responsible for setting the Dietary Guidelines for Americans. Good science is an enemy to no one, since it advances understanding and knowledge…and thus choice. Good science empowers us with options. Censorship, of course, keeps us uninformed – or worse, misinformed. Ignorance is the ultimate form of repression. Scientists are the first to acknowledge that the sounds of science are not always, immediately, perfectly in tune. It can take any number of revisions to get the lyrics and melody of truth just right. But this very process leads us robustly and reliably toward truth and understanding. …When science is subordinated to silence, and the press to propaganda – only tyrants control the flow of information. As readers of this blog will know, Dr. Katz’s recent concerns about “censorship of science” are quite the turnaround. In 2015, Dr. Katz was one of 180+ co-signers to a flagrantly censorious retraction demand organised by the Center for Science in the Public Interest (CSPI) – a powerful Washington, DC nutrition lobby group. 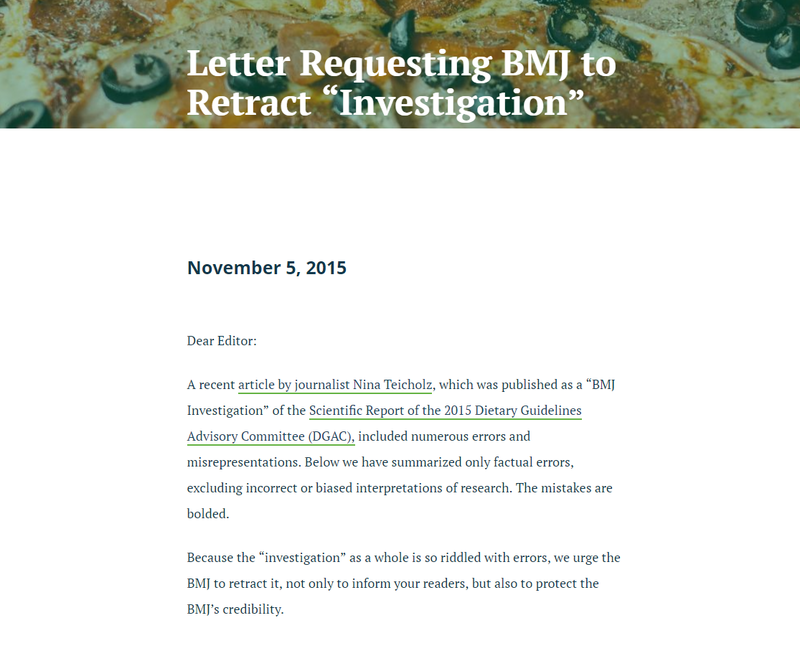 In a letter to the BMJ, the CSPI had requested a retraction of an article by New York Times bestselling author/journalist Nina Teicholz about the questionable science underpinning the 2015 US Dietary Guidelines. It’s not the only time Dr. Katz has attacked Teicholz in the media. As reported on The Sidebar – my Atlanta, GA blogging buddy Peter M. Heimlich’s crack investigative journalism blog – Dr. Katz has been “clawing” at Teicholz for years. That month, several prominent physicians criticised Dr. Katz for his ad hominem remarks, leading Yale University’s School of Medicine to publicly disassociate from its otherwise unrelated namesake, the Yale-Griffin Prevention Research Center, of which Katz is the founding director. Yesterday, I e-mailed Teicholz for comment about Dr. Katz’s sudden change of heart re: his “censorship of science” tweet. Strangely, Dr. Katz maintains that he – not Teicholz – is the victim of a “cabal” funded by “the beef industry.” The claims go back to November 2015, following the Huffington Post’s decision to pull two of Dr. Katz’s articles after it was revealed he had reviewed a sci-fi novel he wrote under a pseudonym, without disclosing authorship. Later that month, he wrote an article via LinkedIn, in which he connected the retractions – the result of an unrelated enquiry by Peter M. Heimlich – to Teicholz’s BMJ article. But as Peter told the Yale Daily News, he was unaware of the dietary guidelines dispute when he broke the story on his blog. Dr. Katz’s review has since become infamous on the Internet for its lavish prose and self-reverential comparisons to legendary writers like Milton, Yeats, Dickens and Plato. I found the writing — prose that nonetheless managed to hint at epic poetry — as enthralling as the story was riveting. In reVision, Colleen McCullough meets John Milton. Yeats meets Yourcenar. In the blend of rollicking adventure with utopian aspiration, J.K. Rowling meets Gene Roddenberry. Where characters are vividly rendered and complex ideas distilled to stunningly simple clarities, Dickens meets Dawkins. As a clash of other worlds illuminates the better ways our world might be, Plato’s Republic meets Lord of the Rings. Where lyrically beautiful writing and deep currents of humanism traverse expanses of law and folklore, science and faith, passion and politics — the Bible, Bill of Rights and Bhagavad Gita commingle. 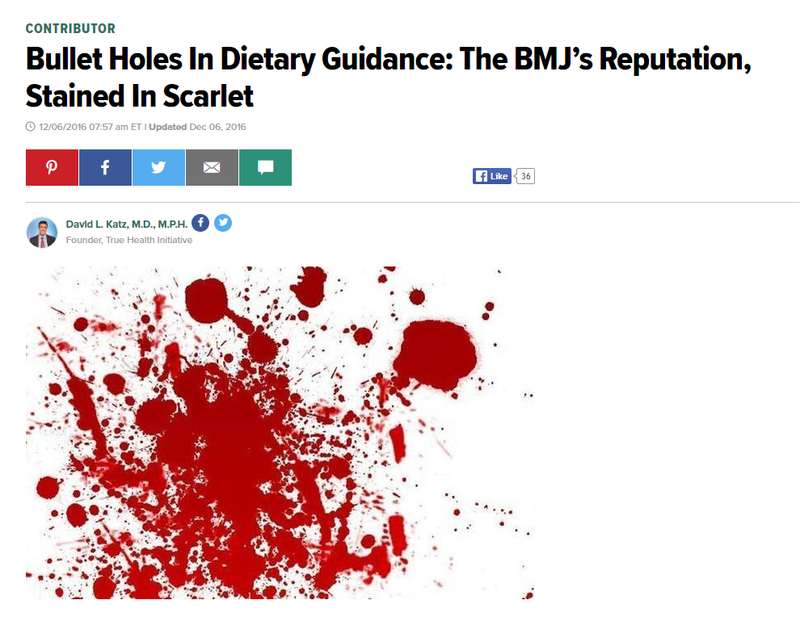 See also: “Butter, Meat and Free Speech,” my December 3, 2016 item re: The BMJ’s decision not to retract Teicholz’s dietary guidelines article. I’ve often wondered why the beef industry, or the dairy industry for that matter, would be strongly motivated to campaign against the dietary puritanism of the DGA. Advice to eat “lean meat” and “fat-free milk” opens the door for these industries to increase their profit margins by selling so-called value-added, that is, more intensively processed and packaged, products. This wouldn’t be the case if the DGA recommended “meat and organ meats” and “whole dairy”. The meat fat that’s going to waste is used in cosmetics, candles, and a thousand other products, the dairy fat is used in “guilty pleasure” products that people also eat, but that are probably less “healthy” than whole dairy products and butter-cooked meals. So there’s really little if any financial loss, and probably a benefit, from DGA interference in these industries, which is why they’ve tended to hedge their bets by funding useful research, instead of launching an all-out attack on the saturated fat diet-heart hypothesis, despite its moribund state.